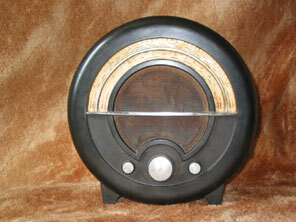 Shown here is the Ekco AC76, the first of the "round" Ekco receivers designed by Wells Coates on the classicwireless site. The very first "round" Ekco was the AD65 from 1934, the AC76 from a year later was the second in the series. The cabinet design is similar, sporting a semi-circular tuning scale in the top half of the cabinet. A horizontal bar protects the large expanse of speaker cloth. This is the much rarer black and chrome cabinet, though the set also came in mottled brown bakelite. Unlike the Ekco AC85 seen already and the AC86 on the next page, this particular example has not as yet undergone restoration. However as may be seen it is completely original inside, even the paper block electrolytics are still remaining. This receiver will be rebuilt concealing new components within the old capacitors and rebuilding them as seen on the AC85 and AC86. This receiver came to form part of the collection as a result of this site, so I have some idea of its history. It was originally bought in Plymouth, and remained there in the same family for all its life until recently. It was used as a kitchen radio until the 1960s. During WWII it was kept on the fireplace mantel and used to follow the latest wartime news. Since Plymouth was an important military naval base at the time the area drew attention from overhead bombing, and one such localised explosion blew the radio off its position on the mantelpiece. Perhaps giving a lie to the vulnerability of bakelite the cabinet survived intact, though regrettably one of the family resident in the house at the time lost their life during the raid. The radio is quite easy to work on, as the entire chassis including speaker can be removed from the cabinet as a single assembly. Like the AC85 already seen, the AC76 incorporates a Noise Suppressor control. This control is to the right hand side of the cabinet placed lower down so that it does not detract from the appearance of the receiver. The control is continuously variable, and the knob is calibrated "Strong", allowing only the most powerful transmitting stations to be tuned in, as it applies a lot of suppression. The purpose of the control at that position is to suppress weaker stations and local noise, so only stations capable of overwhelming local noise would be received. As the control is advanced to the "Medium" position a greater choice of stations would be heard, this position being intended for areas of reduced local noise (e.g. no adjacent tram tracks or refrigerator compressors). At the "All Stations" position at the far end of the control's travel minimal suppression is applied, so all stations as well as any local noise would be heard. 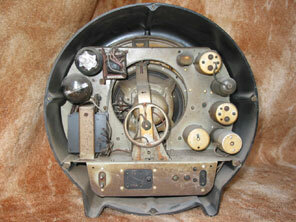 The receiver offered sockets for an extension speaker, and also for a gramophone pick-up. The cabinet is larger than people often imagine it to be at 16 ½" x 10". It cost £12.1.6 in black and chrome as shown, or £11.11.0 in mottled "walnut" brown. Valve line-up is FC4, AC/VP1, V914, AC2/PEN, UU3.